Department of Nephrology, INSERM U507, Hôpital Necker, Paris, France. 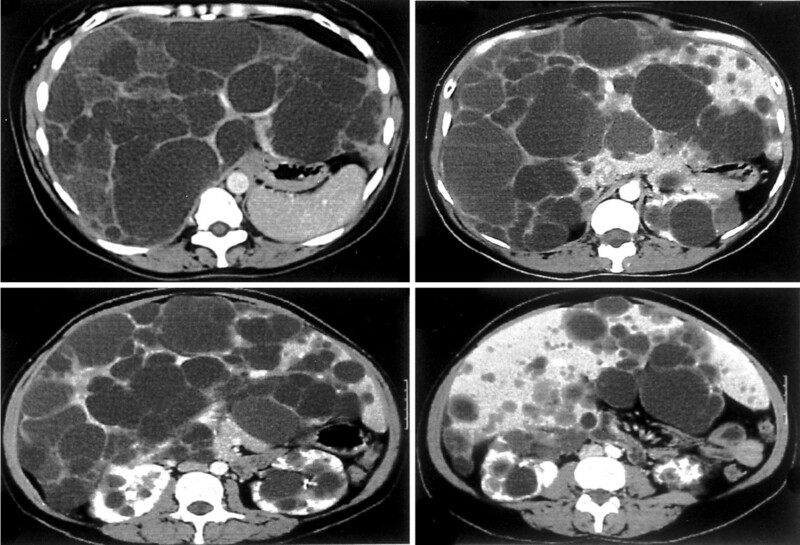 Liver involvement is the most frequent extrarenal manifestation in autosomal-dominant polycystic kidney disease (ADPKD). Liver cysts are responsible for most hepatic complications, but other liver changes may occasionally be encountered, including congenital hepatic fibrosis and segmental dilation of the biliary tract. Both molecular and cellular changes implicated in liver cystogenesis have recently been enlightened by advances in genetics of ADPKD and the development of genetically modified animal models. Although most patients with ADPKD report no liver symptoms, some experience chronic manifestations related to progressive increase of the polycystic liver. Ultimately, disability may severely affect their quality of life. In addition, a few develop acute complications that follow a life-threatening course. An armamentarium of surgical procedures may now be offered to the most disabled patients, including liver resection or transplantation. Because early complications and mortality after either procedure remain frequent, the hazards of surgery have to be balanced against benefits; therefore, selection of the optimum therapy still remains a challenge. This article focuses on ADPKD patients with symptomatic liver involvement and provides guidelines for therapy in polycystic liver disease (PLD). In the general population, the prevalence of simple liver cysts detected by ultrasonography increases with age, reaching 4% at approximately 70 yr of age. Paralleling findings on simple cysts in the kidney, most liver cysts are solitary, but two or three cysts are found in one fourth of the patients with simple nonparasitic hepatic cysts. Polycystic liver as an isolated disease may be sporadic or dominantly inherited. Because no large systematic screening for liver and renal cysts has been performed in relatives of the patients with PLD, the respective prevalence of the hereditary and sporadic forms is not known. In most cases, PLD is related to ADPKD and is linked either to PKD1 (the main locus responsible for the disease) or to PKD2. The isolated form of autosomal dominant PLD has been firmly established as a distinct inherited disorder unlinked to PKD1 or PKD2 (1). In ADPKD, liver cysts seem to develop later than renal cysts. Cross-sectional studies by ultrasonography or enhanced computed tomography (CT) scan demonstrate a steady increase in frequency with advancing age. Although liver cysts are very rare for people younger than 20 yr, their prevalence increases from 20% in the third to 70% in the seventh decade of life, reaching a plateau beyond this threshold (2). Why liver cysts do not develop in some elderly ADPKD patients remains unknown. It is interesting that CT scan quantitation in PLD has demonstrated no decrease in liver parenchymal volume but rather an increase in liver cyst volume (3). Whether subtle differences regarding liver phenotype, such as age at onset or prevalence, exist among PKD1 and PKD2 families warrants further investigation. Women are more prone to liver cystic involvement than are men. Liver cysts are not only recognized earlier but also are more numerous and larger in females than in males. In the United States, it was found that the number of pregnancies correlates with the number of hepatic cysts. In addition, previous use of estrogens was identified as a risk factor for harboring liver cysts. In postmenopausal women, a case-control study documented that a 1-yr course of Premarin is associated with a 7% increase in liver volume resulting from parallel changes of cystic and parenchymal volumes in the treatment group versus a -2% change in the control group (4). Whether use of nonequine estrogens, as is currently practiced in most European countries, carries a similar risk is not known. 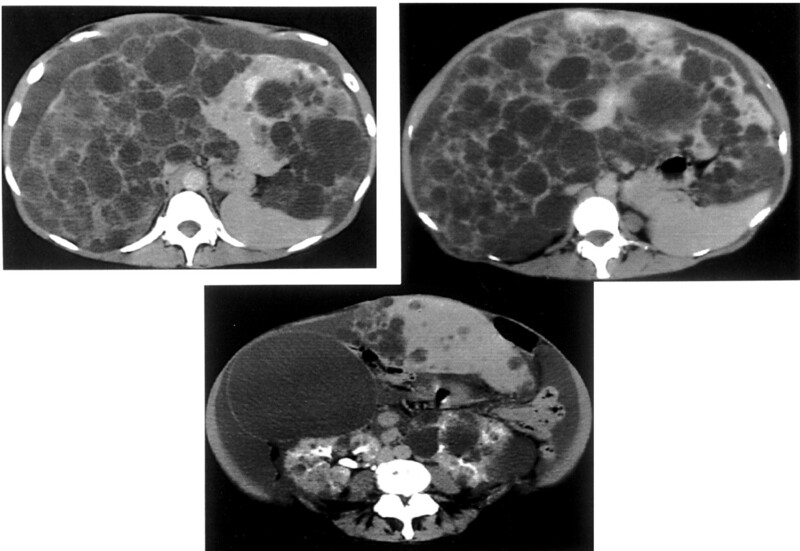 A minority of ADPKD patients develop massive cystic involvement of the liver. Most are women. Familial aggregation for massive liver cystic disease is rare. Symptomatic PLD may occur in very young women and contrast with the mildness of renal involvement. For instance, in our experience, summarized in 1997 and based on 37 ADPKD patients with massive hepatomegaly, 35 were females and only 1 of 110 ADPKD relatives had experienced symptomatic PLD (5). Median age at first hospitalization for liver symptoms was 46 yr (range, 23 to 64 yr), and renal involvement was extremely heterogeneous; 47% of the patients had serum creatinine below 120 μmol/L, 22% had moderate to severe renal failure, and 21% were on regular dialysis. In contrast to the North American data, we found that numerous pregnancies or use of estrogen-containing contraceptives as not a prerequisite for massive liver disease because four women (11%) had never used contraceptives and seven (20%) had never been pregnant. In summary, epidemiologic evidence suggests that a specific mutation is not implicated in the liver phenotype in most cases but that the latter is strongly influenced by the hormonal environment. Before identification of the primary molecular mechanism of cystogenesis (see below), PLD was regarded as a disorder of the development of small intralobular bile ducts. Embryologic studies suggest an abnormality of remodeling of the ductal plate. Actually, liver cysts in ADPKD patients arise from two different structures. Intrahepatic cysts originate from biliary microhamartomas. The latter represent overgrowth of bile ductules. While growing, they become disconnected from the bile ducts from which they derive, although the epithelial lining retains the distinctive characteristics of biliary epithelia. 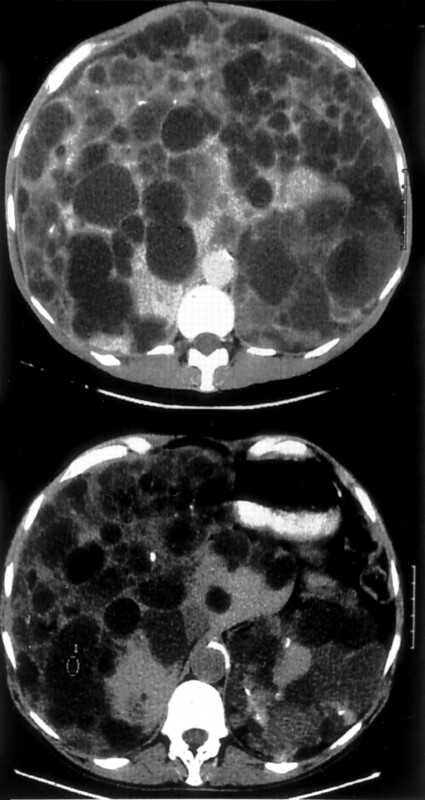 These cysts are mostly located in the peripheral portions of the liver, exhibiting an intraparenchymatous location on contrast-enhanced CT. Their diameter varies from less than 5 mm to more than 10 cm. It is surprising that peribiliary glands that surround large intrahepatic bile ducts also undergo cystic dilation in polycystic patients (6). The corresponding cysts typically are tiny and are located in the hepatic hilum or surround the larger portal tract. Basic research has generated relevant techniques and information regarding liver cyst formation and progression. Immortalized epithelial cell lines from normal human intrahepatic biliary epithelium and from ADPKD liver cysts is a valuable tool to determine how the function of the biliary epithelium is altered in ADPKD and how pharmacologic agents may prevent cyst development (7). The pattern of expression of polycystin-1 and polycystin-2 in liver cysts and kidney cysts is very similar. Most liver cysts stained positive, and there was a striking coincidence of expression of the two polycystins; for example, each polycystin-2—negative cyst in a PKD2 patient also lacked polycystin-1 (8). Inactivating somatic mutations have been found in liver cyst epithelia, like in renal cysts, supporting the “two-hit” model as a unifying mechanism of cystogenesis (9). Heterozygous mice with targeted mutations in Pkd1 (10) or Pkd2 (11) develop liver cysts that are indistinguishable from those found in ADPKD patients. In contrast, homozygous mice that die in utero or early in the postnatal period have a normal biliary system and no liver cysts, suggesting that Pkd1 and Pkd2 are required in the maintenance but not in the formation of biliary ducts. These homozygous mice have renal (and pancreatic) cysts, showing that as in human disease, liver cysts develop later in life than do kidney cysts. These results suggest that Pkd1± or Pkd2± mice provide a relevant model of the pathophysiology of ADPKD. The risk of suffering a complication related to PLD is ill-defined. No accurate assessment of its prevalence is available. Fifteen years ago, in the predialysis era, very little attention was paid to liver complications, apart from sporadic complications mentioned in case reports. In a first attempt to delineate liver lesions in ADPKD patients on renal replacement therapy, we were impressed by the severity of hepatic complications. Hepatic cyst infection or cholangiocarcinoma was responsible for 10% of deaths, most occurring in patients on regular dialysis (12). In the most recent period, it was shown that liver complications have a limited impact on outcome and are less frequent on renal replacement therapy than expected on the basis of these early observations (2). A large experience in the management of massive PLD has accumulated in several surgical series. We have documented a trend toward earlier liver morbidity, as exemplified by younger age at hospitalization for liver complications (19 to 64 yr) and less severe renal involvement, with a 21% rate of patients on renal replacement therapy. Although recruitment bias may account for this trend, it is also possible that changes in the exposure to estrogens have modified the natural history of PLD. While most patients with polycystic liver have a “huge, silent, and durable liver” (12), those with PLD mostly complain of pain. Acute pain usually denotes acute complication (see Table 1). Right abdominal pain and fever in the ADPKD patient should prompt the physician to rule out infection of the right kidney and to consider infection of a liver cyst. Concurrent elevation of liver enzymes is often found in the latter. Approximately 50% of the infections are nosocomial and complicate percutaneous liver cyst fluid aspiration (5). Spontaneous infection predominantly affects patients on dialysis. Localization of the infected cyst(s) may be difficult. The physician has to rely on imaging techniques. The causative microorganism should be identified by blood culture or puncture of the suspected cyst. The physician should use a combination of antibiotics, relying on drugs with proven penetration in cysts, such as ciprofloxacin (13) or amikacin (5), and possibly ceftriaxone, which is concentrated in bile. Drainage is not a prerequisite, but if treatment with antibiotics fails, percutaneous drainage or hepatic resection should be considered (2, 13). Severe hemorrhage of liver cysts may present with symptoms that mimic those of an infected liver, but this complication occurs less frequently in our experience. Magnetic resonance imaging differentiates best the hemorrhagic liver cyst from the cyst with other complications, because it is associated with a hyperintense signal in T-1 and T-2 images. On very rare occasions, acute pain is associated with torsion or rupture of massive liver cyst with hemoperitoneum (14). Chronic symptoms related to huge polycystic liver include abdominal heaviness or distension, and intermittent or continuous pain. Mechanical compression displaces adjacent organs, including gut, diaphragm, and abdominal wall, and is responsible for early satiety, dyspnea, abdominal hernias, and uterine prolapse. At the end of the spectrum, extreme disability, malnutrition, and physical exhaustion may be present. In contrast to progressive deterioration of renal function over decades, hepatic function remains unaffected whatever the size of the liver. This is ascribed to the preservation of liver parenchyma. Symptoms of liver failure should prompt investigation for a diagnosis other than PLD. However, in massive PLD, moderate increases in serum γ-glutamyl transferase or alkaline phosphatase ranging between 2 and 5 times the upper limit of normal range are noted in two thirds and half of the patients, respectively. Serum levels of aminotransferase or bilirubin are elevated in fewer than 20% of the cases. In addition, a poor nutritional status is not rare in these patients, as assessed by serum albumin and total cholesterol (5, 15). Ascites and variceal bleeding are uncommon in the polycystic patient. The initial workup should include routine analysis of the ascitic fluid, when present, to rule out an infective process and endoscopic examination of the upper gastrointestinal tract. If portal hypertension is diagnosed, then three diagnoses should be considered (16). First, when few or no liver cysts are demonstrable in the patients before 30 yr of age, congenital hepatic fibrosis (see below) or liver cirrhosis should be suspected. Second, mechanical compression of portal venous flow by liver cysts may affect the main portal vein or intrahepatic portal radicles causing portal hypertension. In rare cases, variceal bleeding was the presenting symptom. Finally, when a huge cystic liver is present (Figure 1), hepatic venous outflow obstruction (HVOO) is the most likely diagnosis. In that case, obstruction is due to compression of hepatic veins or of the inferior vena cava or both by one or multiple cysts. At least 30 patients with PLD and HVOO have been reported, most of them in three series (5, 17, 18). Twenty-seven of them had polycystic kidneys. Ascites is exudative and intractable. The high protein content of the ascitic fluid has been ascribed to high permeability of the dilated sinusoidal walls to proteins. In rare cases, hepatic vein thrombosis may be superimposed. Histologically, extensive sinusoidal dilation is found. In addition, the lumen of small supralobular branches of the hepatic veins may be narrowed or occluded by organized thrombi (18). 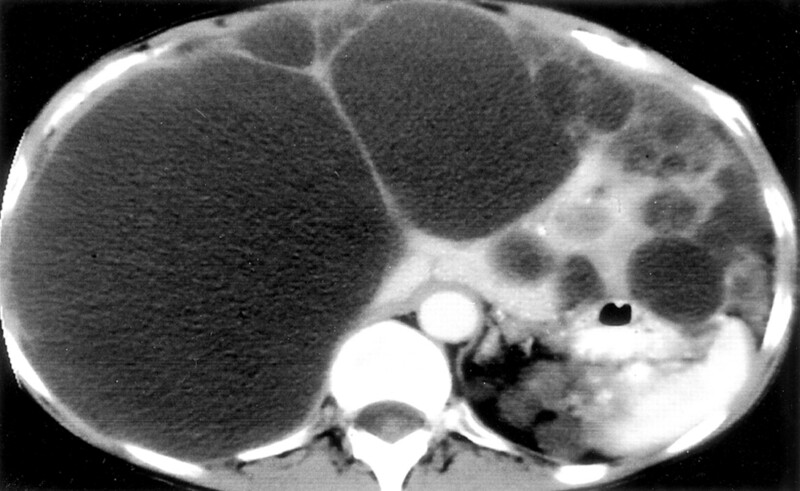 Contrast-enhanced computed tomography (CT) scan showing massive polycystic liver disease (PLD) with diffuse small cysts but a single large cyst and ascites in a 57-yr-old female ADPKD patient. Only the caudate lobe was spared. Serum creatinine was 105 μmol/l. How can one diagnose hepatic venous outflow obstruction? Doppler ultrasound and CT easily show compression of hepatic veins and the inferior vena cava by voluminous cysts in posterior location. Evidence of hepatic venous outflow obstruction can be obtained (1) by hemodynamic studies showing a pressure gradient across the site of obstruction, (2) by cavography demonstrating compression and collateral circulation (16), (3) or by evidence of hepatic vein occlusion. Magnetic resonance imaging permits assessment of patency and flow direction in the hepatic or portal veins as well as the inferior vena cava in PLD patients (17). Jaundice is rare and suggests bile duct compression in the porta hepatis. Low cardiac output with recurrent hypotension during the hemodialysis session may be related to compromised blood flow in the inferior vena cava as the result of compression by a cyst. Acute hepatic vein thrombosis and Budd-Chiari syndrome have been reported after uni- or bilateral nephrectomy in ADPKD patients (19). Progressive hepatic failure has also been reported recently, but the underlying mechanism remains unclear (20). Congenital Hepatic Fibrosis. Congenital hepatic fibrosis (CHF) is a constant feature of the recessive form of PKD. Nevertheless, CHF has now been recognized in more than 20 patients with ADPKD. All cases reported so far concerned PKD1 families (21). In contrast to renal cystic disease, vertical transmission of liver involvement was not observed in these families, but some siblings were affected. The molecular mechanism of such phenotypic variability has not been elucidated (22). In CHF, portal hypertension may be present in early childhood or before 25 yr of age. Spleen enlargement and variceal bleeding are prominent findings. If present, ascites is transudative. Liver cysts were detected in only two cases of CHF. CHF may be associated with focal or diffuse cystic dilation of the segmental bile ducts (Caroli's syndrome), which is well visualized by cholangio-CT or Magnetic resonance cholangiography. Conventional treatment of portal hypertension, including nonselective β-blockers, is indicated in these patients. Malignant Tumors. A few cases of cholangiocarcinoma have been identified (12). An intriguing association of malignant liver cysts and pancreatic cystadenocarcinoma has been reported in two sisters with ADPKD (23). Striking advances in liver surgery and transplantation have been made recently, but the selection of the appropriate approach remains a challenge. It has become appealing to reduce liver size in the most severely affected patients, but surgery carries a significant risk. There is no consensus concerning the selection of the patients, the optimal timing, and the best mode of therapy. One should evaluate the patient for the presence of discomfort and physical impairment related to liver size, superimposed liver complications, and renal function, and overall physical condition should be assessed. Finally, limitations and complications of surgery must be discussed with the patient. Percutaneous aspiration should always be combined with sclerotherapy using alcohol or minocycline to minimize recurrence as a result of fluid secretion by the cyst wall. Sustained improvement is observed in half of the patients, and a second attempt is effective in half of those with primary failure. Cyst infection and peritoneal or biliary leak of alcohol are the major risks of the technique. Sclerotherapy should be considered if a limited number (fewer than 5) of large cysts have to be treated (Figure 2). It usually offers temporary relief. Contrast-enhanced CT scan before (A) and 6 mo after (B) successful alcohol sclerotherapy of two liver cysts responsible for painful protrusion underneath the sternum. In selected patients, judicious stenting may reestablish flow patency and abolish pressure gradient as a result of cyst compression in the portal or the caval circulation. Percutaneous portal venous stenting and transhepatic portosystemic shunt (TIPS) were used in two patients who had contraindication to major liver surgery and who had variceal bleeding and refractory ascites, respectively. Inferior vena cava stenting has also been used successfully (Figure 3). (A) Cavogram showing extrinsic compression of the inferior vena cava by a liver cyst at the level of the hepatic vein. A pressure gradient of 12 mmHg was documented across the segment compressed by the cyst. (B) Stenting of the vena cava restored patency and achieved immediate relief of symptoms. Resection or fenestration of the cyst wall has long been the standard treatment of symptomatic PLD (24). It is mostly used for superficial cysts. Large cysts in anterior, lateral, or even superior location expose a great proportion of their wall (Figure 4). In contrast, resection or fenestration is not effective for small cysts within the parenchyma, which expose little of their surface. For instance, 5 of 13 patients treated by Farges had multiple small cysts and experienced unsatisfactory results (24). Postoperative ascites is the most common complication. After broad unroofing of the cysts, fluid is secreted into the peritoneal cavity but it is readily absorbed. Ascites occurs if the daily rate of secretion exceeds the resorption capacity of the peritoneum, i.e. approximately 900 ml in patients with normal renal function. Treatment of ascites is troublesome, especially in patients with chronic renal failure, in whom ascites may follow a protracted course. Some surgeons are reluctant to insert suction drains because they can promote peritoneal infection. Diuretics may be effective. Repeated paracentesis is often required. Anecdotal reports suggest that cimetidine or somatostatin analogs may be of value by decreasing fluid secretion (25). Apart from ascites, complications also include injuries to blood vessels or bile ducts adjacent to the wall of the cysts. For experienced liver surgeons, fenestration is a low-risk therapy. Nevertheless, in the long term, symptoms recur in 23 to 57% of cases (24, 26). Laparoscopic fenestration has been performed in PLD (27, 28). Advantages include rapid recovery and fewer postoperative adhesions. In the largest series, 11 of 13 patients experienced initial improvement, but symptoms recurred in 8 of them within 6 to 24 mo. Recurrence occurred later in patients in whom large cysts predominated. Contrast-enhanced CT scan of the abdomen showing few massive cysts in the right lobe of the liver in a 46-yr-old female ADPKD patient with mild renal involvement. Fenestration of the two largest cysts achieved long-lasting improvement. Cyst fenestration should be performed in symptomatic patients with few superficial large cysts (>5 cm in size except in posterior location) and with moderate renal failure (serum creatinine < 200 μmol/L). Relief of symptoms is usually achieved, morbidity is low, but recurrence is the rule. When possible, the laparoscopic approach is recommended because it reduces subsequent adhesions and can be repeated. Liver resection is more risky, because cysts distort the anatomy of the liver. One attempts to remove the most affected cystic segments, as assessed by CT scan. An average of three to four liver segments are usually removed by anatomic or nonanatomic resection (15, 22, 29). Transverse hepatectomy has also been recently advocated in cases in which cysts are primarily located in the anterior segments (30). Parenchymal transection is then combined with fenestration of cysts. Concomitant fulguration of opened cystic cavities is achieved by using electrocautery or argon-beam coagulation. Even in the hands of experienced liver surgeons, liver resection in PLD carries a substantial risk. Cumulative data from series including at least five patients suggest a mortality rate of up to 42% (mean, 7.5%) (Table 2). Morbidity was reported in 37 to 83% of cases, including ascites, hemorrhage, biliary leak, infection, and, more rarely, pancreatitis (25, 30) or acute Budd-Chiari syndrome (30). Renal function is usually not permanently compromised by the surgical procedure. Liver function remains unaffected. Most symptoms related to hepatomegaly resolve, and limitation in daily activities as well as nutritional status improve (15, 25, 26, 29, 31). Preoperative ascites related to hepatic venous outflow obstruction may resolve (15). Unfortunately, disabling and long-lasting postoperative ascites is frequent, especially in patients with severe renal failure or on hemodialysis. In three of our patients, ascites disappeared only after paracentesis combined with reinjection of the ascitic fluid in the venous line during the dialysis session, or after renal transplantation, respectively (29). In the long run, almost all patients experience sustained improvement (Figure 5) despite early complications. In the largest series published, mean liver volume as estimated by CT scan decreased from 9357 cm3 to 3567 cm3 after liver resection (15). Of note, liver volume remained stable postoperatively in almost all patients. However, we have observed marked enlargement of the liver in a 34-yr-old woman as a result of expansion of residual cysts that required a second resection 4 yr after an initial successful procedure. Such late recurrence was also observed in the youngest of the 31 patients operated on at the Mayo Clinic (15). Overall, massive polycystic enlargement by small cysts is better treated by liver resection than by fenestration alone. As patients with severe renal failure seem to be at higher risk of severe complications, we advocate considering liver resection when serum creatinine is still below 200 μmol/L. CT before (top) and one year after (below) liver resection in a 46-yr-old female ADPKD patient. Note enlarged left kidney. For diagnoses other than PLD, 1- and 5-yr survival rates after liver transplantation exceed 85 and 70% in most centers. Advanced renal failure before transplantation adversely affects postoperative survival. After transplantation, the quality of life is excellent for most recipients. In the long run, immunosuppression can be safely withdrawn in a minority of patients. Liver transplantation is a drastic solution for the eradication of symptoms in massive PLD. It has been rarely used in the treatment of PLD, because patients typically present with preserved hepatocellular function. Excluding anecdotal reports, six series of PLD patients treated by liver transplantation are available (Table 3). Among 51 patients, most had cystic kidneys, 90% were female. Before liver transplantation, all had disabling PLD with severe reduction of normal activities, and half of the patients had undergone cyst aspiration and/or surgical procedures, without long-term improvement. A single patient presented with liver failure secondary to concomitant chronic hepatitis B (32). Combined liver/kidney transplantation was performed in 22 patients (44% of cases). Combining all series, mean follow-up was 4 yr (range, 0 to 11). Among the 51 patients, the 1-yr mortality rate was 18%. Most early deaths occurred within 2 mo after transplantation and similarly affected liver and liver/kidney recipients. Mortality was mainly the result of severe superimposed infections in patients whose condition was poor before transplantation (33, 34). Two additional patients died 15 and 24 mo after combined liver/kidney transplantation. The average morbidity rate as a result of surgical complications was 42%. It was even higher in patients in whom surgical procedures had been performed before transplantation. During a short follow-up (less than 18 mo), the course of renal function after isolated liver transplantation in seven ADPKD patients remained unchanged in two and deteriorated in five patients. The mean decrease in glomerular filtration rate was 15 ml/min per year (7 to 37 ml/min per year), and three patients required hemodialysis within 3 to 5 yr. The rate of decline was thus higher than expected in ADPKD patients (-5 ml/min per year). These data are consistent with an early decline in glomerular filtration rate that is found in liver transplant recipients who do not have ADPKD, i.e. minus 40 to 50% as early as 6 mo after transplantation (35). In the subgroup of ADPKD patients treated with liver/kidney transplantation, accurate estimation of renal function at transplantation is available in only nine patients; three were on regular dialysis, and the remaining patients had moderate to severe renal failure. The rationale for preemptive renal transplantation in PLD patients before end-stage renal failure has been reached was the fear that administration of cyclosporine A or FK506 would hasten the decline of renal function and precipitate the need for dialysis (36). In addition, kidney graft survival is significantly higher in liver/kidneys recipients as compared with kidney recipients alone, as the liver allograft protects the kidney from acute rejection (37). Is this immunologic advantage an argument for combined transplantation in patients with PLD and renal cysts? Probably not. It is difficult to monitor the renal graft after preemptive kidney transplantation while native kidneys are still present. Not unexpected, the diagnosis of acute rejection or graft thrombosis has repeatedly been delayed in such patients (32). Accordingly, several authors warn against preemptive renal transplantation in PLD patients, at least when renal failure is still mild to moderate. Isolated orthotopic liver transplantation should be considered in ADPKD patients with severly disabling PLD when patients have diffuse cystic involvement and portal hypertension or poor liver function or when liver resection has failed or cannot be used (Figure 6); ideally, it should be performed before patients are in poor physical condition. Combined liver/kidney transplantation should be restricted to patients with advanced renal failure. 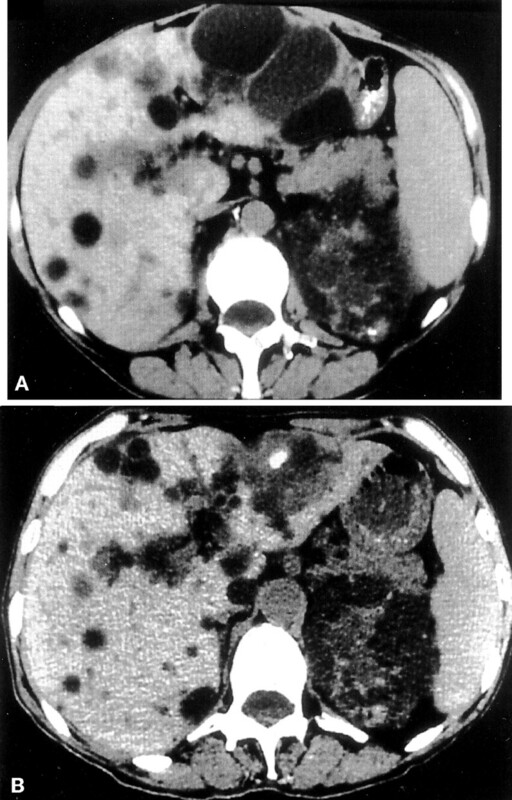 Contrast-enhanced CT scan of the abdomen in a 39-yr-old female patient with ADPKD and massive polycystic liver disease with portal hypertension. Note gastric compression and displacement of the inferior vena cava (top, left), but only mild renal cystic disease. Liver transplantation was successful in achieving long-term symptomatic relief. Considerable insight into the pathogenesis and natural history of PLD in patients with ADPKD have been gained during the past 2 decades. In the future, clear identification of genetic and environmental modifiers will increase understanding of the development and growth of liver cysts and help to identify patients who are at risk for developing an extreme liver phenotype. In the meantime, for patient with massive liver cystic disease, it is imperative to develop rational guidelines to establish the indications for liver resection and liver transplantation, respectively, as well as their optimal timing.